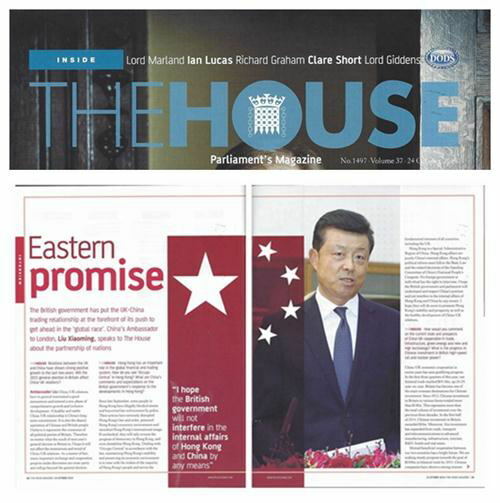 On 24th October, Ambassador Liu Xiaoming speaks to The House Magazine about the China-UK partnership. The House: Relations between the UK and China have shown strong positive growth in the last two years. Will the 2015 general election in Britain affect China-UK relations? Ambassador Liu: China-UK relations have in general maintained a good momentum and entered a new phase of comprehensive growth and inclusive development. A healthy and stable China-UK relationship is China's long-term commitment. It is also the shared aspiration of Chinese and British people. I believe it represents the consensus of all political parties of Britain. Therefore no matter what the result of next year's general election in Britain is, I hope it will not affect the momentum and trend of China-UK relations. As a matter of fact, many important exchange and cooperation projects under discussion are cross-party and will go beyond the general election. The House: Hong Kong has an important role in the global financial and trading system. How do you see 'Occupy Central' in Hong Kong? What are China's comments and expectations on the British government's response to the developments in Hong Kong? Ambassador Liu: Since late September, some people in Hong Kong have illegally blocked streets and boycotted law enforcement by police. Their actions have seriously disrupted Hong Kong's law and order, poisoned Hong Kong's economic environment and tarnished Hong Kong's international image. If unchecked, they will only reverse the progress of democracy in Hong Kong, and even destabilise Hong Kong. Dealing with 'Occupy Central' in accordance with the law, maintaining Hong Kong's stability and preserving its economic environment is in tune with the wishes of the majority of Hong Kong's people and serves the fundamental interests of all countries, including the UK. Hong Kong is a Special Administrative Region of China. Hong Kong affairs are purely China's internal affairs. Hong Kong's political reform must follow the Basic Law and the related decisions of the Standing Committee of China's National People's Congress. No foreign government or individual has the right to intervene. I hope the British government and parliament will understand and respect China's position and not interfere in the internal affairs of Hong Kong and China by any means. I hope they will do more to promote Hong Kong's stability and prosperity as well as the healthy development of China-UK relations. The House: How would you comment on the current state and prospects of China-UK cooperation in trade, infrastructure, green energy and new and high technology? What is the progress in Chinese investment in British high-speed rail and nuclear power? Ambassador Liu: China-UK economic cooperation in recent years has seen gratifying progress. In the first three quarters of this year, our bilateral trade reached $59.5bn, up 20.2% year-on-year. Britain has become one of the main overseas destinations for Chinese investment. Since 2012, Chinese investment in Britain in various forms totaled more than $18bn. This represents more than the total volume of investment over the previous three decades. In the first half of 2014, Chinese investment in Britain exceeded $5bn. Moreover, this investment has expanded from trade, transport and telecommunications to advanced manufacturing, infrastructure, internet, R&D, hotels and real estate. Mutual beneficial cooperation between our two countries has a bright future. We are making steady progress towards the goal of $100bn in bilateral trade by 2015. Chinese companies have shown a strong interest in building British nuclear power plants and high-speed rail. The competent authorities on both sides have signed the MOU on strengthening cooperation in civil nuclear energy and the MOU on cooperation in rail. These two MOUs set out the policy framework for our cooperation in these two sectors. The relevant authorities and industries of our two countries are having intensive consultations aimed at delivering early results. The House: London has become a global RMB trading centre. What is China's plan to further advance China-UK financial cooperation and support London becoming a global centre for offshore RMB business? 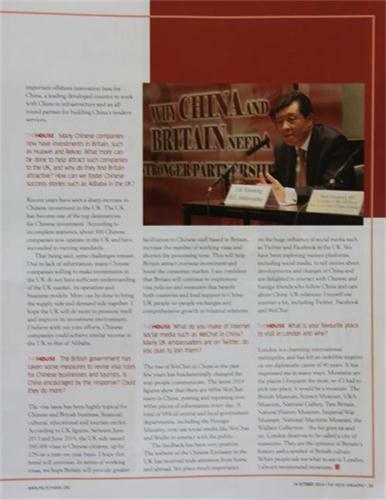 Ambassador Liu: As Chinese Ambassador to the UK, I have witnessed how London's offshore RMB business has started from scratch and gone from strength to strength. In the three years since the Economic and Financial Dialogue launched the program in 2011, London's offshore RMB business has come a long way. Britain was the first to sign a bilateral currency swap agreement with China. London was awarded the first RQFII quota outside Asia. The first RMB clearing bank outside Asia was created in London. London was the first to issue RMB denominated financial products. Notably, the British government has recently issued a 3bn RMB sovereign bond, which has made the UK the first foreign government to issue RMB sovereign debt. It also means RMB has become one of Britain's reserve currencies. Its significance has gone beyond a bilateral scope. Looking ahead to the future, I am confident that London will become one of the world's most dynamic offshore RMB markets. However, we should also be aware that RMB internationalisation cannot be achieved overnight. It should proceed in a step-by-step manner. China will deepen financial reform, follow market rules and create favorable conditions for financial and economic cooperation with other countries. I believe the Chinese and British financial sectors should seize opportunities and make joint efforts to boost RMB business in London, take China-UK financial cooperation to a whole new level and inject vigour and vitality to the China-UK comprehensive strategic partnership. The House: How important is the UK's position as a gateway to the European market to Chinese investors? Does Germany have more appeal to them? Ambassador Liu: Britain and Germany each have their own strengths. It is hard to say which has greater appeal. According to my observations, Chinese investors place importance on Britain's unique role in Europe. First, Britain is a champion for free trade and market rules. It is open to Chinese investments in infrastructure, telecommunications and water. Second, Britain is an international hub for finance, trade and information. Its connections with the European, North American, Middle Eastern and African markets are wide and mature. Third, Britain is strong in high-end manufacturing. It is a leader in innovation and R&D. In addition, Britain has accumulated rich experience in many fields such as urbanisation, healthcare, old-age care, energy conservation and environmental protection. China has a lot to learn from Britain's experience. 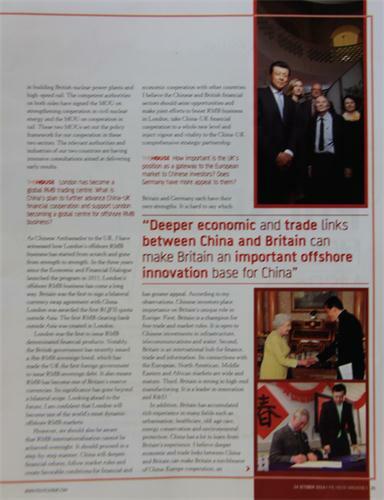 I believe deeper economic and trade links between China and Britain can make Britain a torchbearer of China-Europe cooperation, an important offshore innovation base for China, a leading developed country to work with China in infrastructure and an all-round partner for building China's modern services. The House: Many Chinese companies now have investments in Britain, such as Huawei and Rekoo. What more can be done to help attract such companies to the UK, and why do they find Britain attractive? How can we foster Chinese success stories such as Alibaba in the UK? Ambassador Liu: Recent years have seen a sharp increase in Chinese investment in the UK. The UK has become one of the top destinations for Chinese investment. According to incomplete statistics, about 500 Chinese companies now operate in the UK and have succeeded to varying standards. That being said, some challenges remain. Due to lack of information, many Chinese companies willing to make investments in the UK do not have sufficient understanding of the UK market, its operation and business models. More can be done to bring the supply side and demand side together. I hope the UK will do more to promote itself and improve its investment environment. I believe with our joint efforts, Chinese companies could achieve similar success in the UK to that of Alibaba. The House: The British government has taken some measures to revise visa rules for Chinese businesses and tourists. Is China encouraged by the response? Could they do more? Ambassador Liu: The visa issue has been highly topical for Chinese and British business, financial, cultural, educational and tourism circles. According to UK figures, between June 2013 and June 2014, the UK side issued 390,000 visas to Chinese citizens, up by 22% on a year-on-year basis. I hope this trend will continue. In terms of working visas, we hope Britain will provide greater facilitation to Chinese staff based in Britain, increase the number of working visas and shorten the processing time. This will help Britain attract overseas investment and boost the consumer market. I am confident that Britain will continue to implement visa policies and measures that benefit both countries and lend support to China-UK people-to-people exchanges and comprehensive growth in bilateral relations. The House: What do you make of internet social media such as WeChat in China? Many UK ambassadors are on Twitter; do you plan to join them? Ambassador Liu: The rise of WeChat in China in the past few years has fundamentally changed the way people communicate. The latest 2014 figures show that there are 600m WeChat users in China, posting and reposting over 400m pieces of information every day. A total of 98% of central and local government departments, including the Foreign Ministry, now use social media like WeChat and Weibo to interact with the public. The feedback has been very positive. The website of the Chinese Embassy in the UK has received wide attention from home and abroad. We place much importance on the huge influence of social media such as Twitter and Facebook in the UK. We have been exploring various platforms, including social media, to tell stories about developments and changes in China and are delighted to interact with Chinese and foreign friends who follow China and care about China-UK relations. I myself use internet a lot, including Twitter, Facebook and WeChat. The House: What is your favourite place to visit in London and why? Ambassador Liu:London is a charming international metropolis, and has left an indelible imprint on my diplomatic career of 40 years. It has impressed me in many ways. Museums are the places I frequent the most, so if I had to pick one place, it would be a museum. The British Museum, Science Museum, V&A Museum, National Gallery, Tate Britain, Natural History Museum, Imperial War Museum, National Maritime Museum, the Wallace Collection – the list goes on and on. London deserves to be called a city of museums. They are the epitome of Britain's history and a symbol of British culture. When people ask me what to see in London, I always recommend museums.